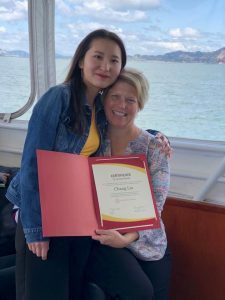 This May, Cambridge Network graduated our largest class of homestay students to date. For this reason, we have been assembling host families for host appreciation events across the country. In the process of celebrating student accomplishments and looking forward to their college matriculation, we observed a special group that has been developing. We’ll call them our “veteran host families.” These families have hosted a graduating international student for 3 or 4 academic years. 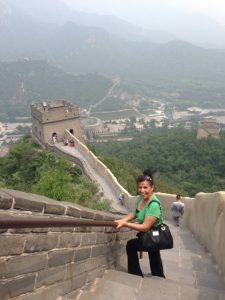 Many families have begun to forge life-long connections, and some have even visited their students’ hometowns and families in China. What a beautiful adventure in cultural exchange and international education! Below we list these families and highlight 6 special stories. There are so many wonderful stories to tell that we had a difficult time choosing whom to highlight. Please enjoy the highlights and let’s celebrate and appreciate all of our veteran hosts! Shannon McCarty and Stacy Hogan are a two-mom couple who hosted Jenny (pictured with host mom Stacy) for three years while she attended York School in Monterey, California. Jenny will be attending UC San Diego starting in the Fall. Shannon and Stacy look forward to moving her into her dorm in the Fall and will also host a new Cambridge Network student. Rosa and Michael Docherty hosted Toby, a student at Our Lady of Lourdes High School in Poughkeepsie, NY for three years. The Docherty’s have embraced Toby as their fourth son. They are incredibly close and supportive of Toby and they enjoy spending time together. Toby loved playing basketball as well as watching sports, television shows and movies with his host brothers. Rosa and Michael even traveled to China to visit Toby and his family (host mom Rosa pictured here during China trip), and they will be going again this summer. 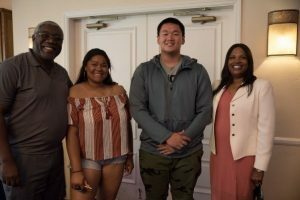 Earl and Annette Hampton hosted Amos, a student at St. Patrick-St. Vincent High School in Vallejo, California, for 4 years. Amos (pictured with host dad, host sister and Support Services Coordinator) played football at SPSV where he was a star player this past season. Amos looks forward to attending Ohio State University this Fall and will miss talking about sports with Earl. 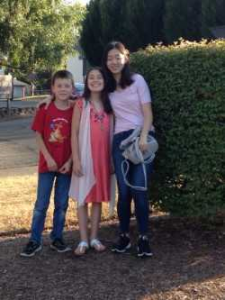 Michael and Mei Lamb hosted Ginger (pictured with host siblings) for 4 years. She will be attending the University of Washington next year after graduating from Archbishop Murphy High School in Everett, Washington. Ginger was a student government officer this past year, ran on the track and cross-country teams, was an active participant on the robotics and math teams, and took many AP and honors classes. Ginger finished her senior year with a 4.0. The Lambs look forward to hosting two more Cambridge Network students this fall! 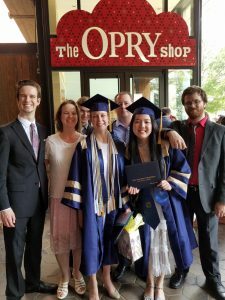 Scott and Kristina hosted Mandy, a student at Pope John Paul II High School in Hendersonville, TN (pictured with host family) for three years. Both she and her host sister, Elena, graduated this year. Mandy was an honor graduate and will be attending NYU to study education. Host mom, Kristina, is an educator and always encouraged Mandy’s passion for the field. The Baker family considers Mandy a part of their family. The host dad, Scott, calls her his daughter. Mandy and Elena were partners on a stock market project for school, and they made their team name “Two Worlds, One Family.” Mandy is already planning her travel to return to the Baker’s home for Thanksgiving next year. Mark and Linda Tomlin hosted George (pictured with host family and a fellow Cambridge Network student) for four years. The entire extended family came to congratulate George at his graduation party. Everyone introduced themselves as George’s aunt, uncle, cousin, grandma, and grandpa. The family is so proud of George and told him throughout the night, “You are family from now until eternity.” The most touching moment was when George’s host grandpa pulled him aside when he was leaving and said, “Son, I love you so much, you will always hold a special place in my heart. 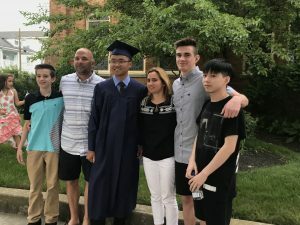 Save me a basketball ticket – I’ll come whenever you ask me!” This fall, the Tomlin family will host another student attending Wildwood Catholic High School in North Wildwood, New Jersey. 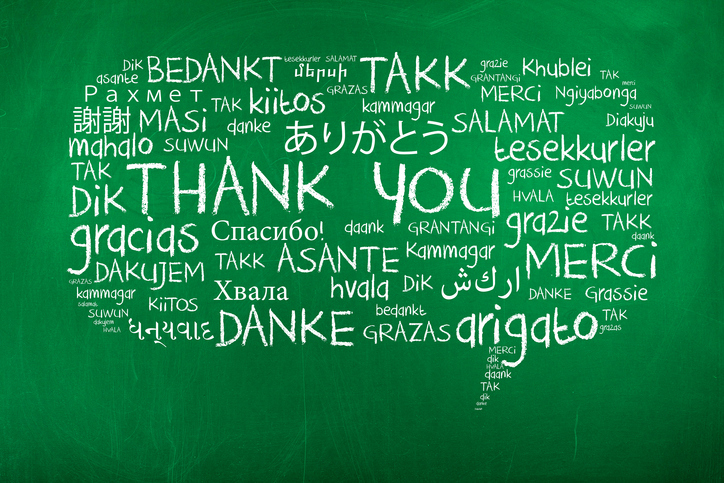 Thank you to all of our veteran host families for helping international students feel at home while they study abroad!